Abigail was shaking watching the last lightbulb flicker ominously. With a pop, it died leaving the stockroom in total darkness except for the small strip of white under the locked door from the light in the hall. She clasped one hand over her mouth to muffle her low panicked moan and she began to rock back and forth. Suddenly, she felt a hand on her arm. She screamed! Abigail burrowed as close as possible to April. She could feel April’s long hair against her face. She loved her boss’ long, black hair. Combined with her beautiful green eyes, Abigail thought April was stunning. She knew she shouldn’t be this close to April. It wasn’t a good idea. She’d had a crush on her boss since her interview and had worked hard to keep her distance and not let her attraction be noticed. She started to move away but stopped immediately when April pulled her up on her lap to hold her closely. 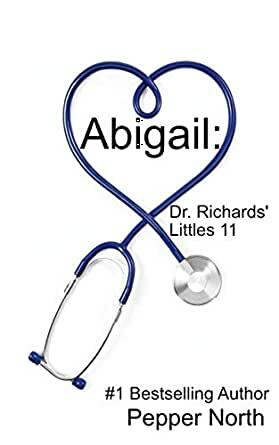 This eleventh story in the popular Dr. Richards' Little series, focuses on Abigail and her boss, April. Who knew that a locked stockroom and burned out light bulbs could match this Mommy with the Little girl of her dreams. Some of the characters from the first eight novels in this series reappear to continue their stories. You do not need to read the stories in order. All are complete stories. The books in this series will feature invasive medical treatments, including thorough examinations and enemas, when required, as well as diaper changes, spankings, and other punishments. If you are offended by age play (adults who choose to live as a Little or a parent of a Little) or dubious consent, this is not the book for you. 5.0 out of 5 starsAWESOME AGE PLAY SERIES! I'm loving this series! Always waiting for the next book. If you are into age play genre, this is a must read series! Just finished the latest in the Little series. Love the interaction between the other Littles. It seemed too short, I just wanted more.